Trekka is a boat of some notoriety as it was built by John Guzzwell at the age of 25 in the early 1950’s and which he sailed around the world on his own and later wrote about the journey in a very entertaining book called “Trekka, Round the World”. Trekka is 20ft 6in sail boat designed by well known yacht designer Laurent Giles that has a strip planked hull sheeted in fiberglass. Today Trekka is under the care of the Maritime Museum of British Columbia in Victoria BC (www.mmbc.bc.ca) where she is at present being stored at the SALTS facilities (www.salts.ca) in downtown Victoria, BC. Update: Since this article she has been moved into the museums display. I was asked to look over Trekka by the MMBC and see how to address some small leaks around mid ship. My original thought from description was that she was in rough shape and needed much work, but was very surprised when crawling through her to find that she was in excellent shape especially considering she had been sailed around the world three times by subsequent owners. I declared I would confidently take her offshore again after only minor repairs, but unfortunately I was not going to head off soon as my job was just to repair her hull. 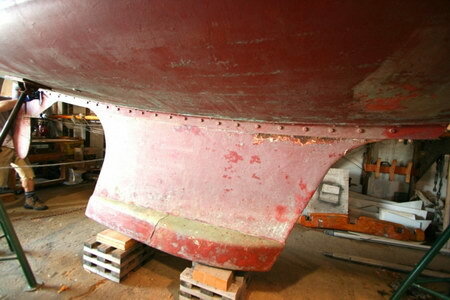 The job was to take off the steel keel with its iron ballast to be sandblasted and repainted and to also remove the keel flanges and keel bolts to be rebedded along with a few other slight things that needed to be restored. 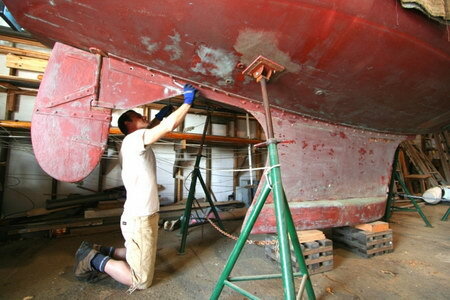 Also, it was found that there was a problem with electrolysis affecting the boat’s metals and surrounding wood that we fixed by isolating dissimilar metals and installing a sacrificial anode. We also made a few repairs to areas of the fiberglass on the hull that had delaminated and split, mostly around mid ship next to the keel, probably due to it being a high fatigue area because of the ballast, and looks like it was the area where the water was getting in. The next time working on Trekka will be to put her all back together. 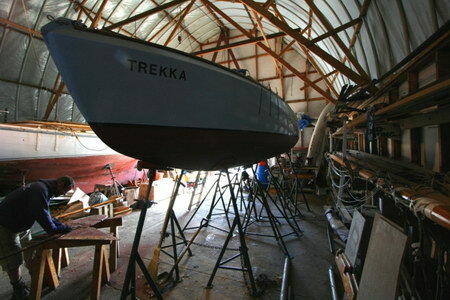 Ready to start work: Trekka with the keel on. 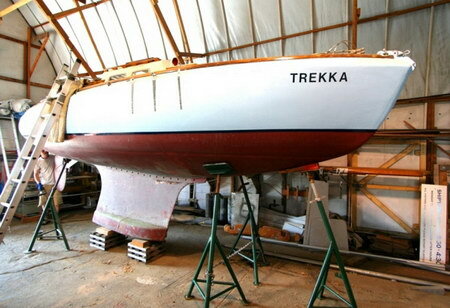 Trekka’s keel: the last time John Guzzwell saw Trekka he wanted to adjust the shape of the keel to increase her performance, but at that time the Museum had to slow him down and say maybe the next time. 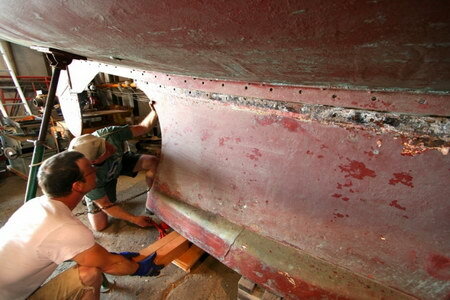 Peter Gron, who is helping me, is working at taking out the flange bolts. After we removed all the bolts that were sandwiching the flange to the keel we let the keel’s own weight slowly drop it down onto blocking. Using a pallet jack we removed the keel from under Trekka which even with the ballast attached was not too hard to move around. 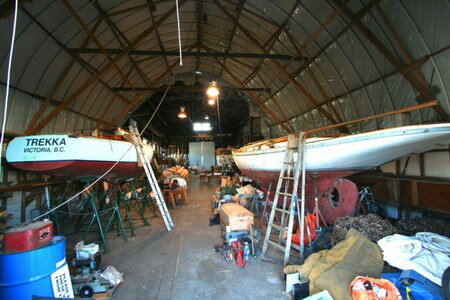 Trekka on the left and Dorothy, a 1894 sailboat, on the right: also owned by the Victoria Maritime Museum, and a view of the large heritage boat shop were SALTS's Pacific Grace a 140ft Gaff schooner was built then launched in 1999. A view of Trekka and the many supports under her while the keel is off so we can keep working on her without fear of her moving.